The all-new entry-level 2014 Mercedes-Benz CLA 180 CDI arrives in Europe and is available now with a low price and high mileage. Mercedes just introduced a new entry-level fuel-stingy CLA-Class diesel in Europe that is sure to light up sales of the sporty compact even more. The new Mercedes-Benz compact models have already been very well received by customers all over the globe, and since the start of the year they have shown a sales increase of more than 60 percent against the previous year. As of October 7, the new entry-level model, a new 2014 CLA 180 CDI Coupe with diesel engine is now available for first-time Mercedes buyers. The four door coupe is attracting millennial buyers who have never purchased a Mercedes car before and are being drawn in by the coupes styling, price and technology. This new diesel entry will likely also be flying out of showrooms. The new entry-level diesel version of the four-door coupe, the CLA 180 CDI, was recently voted the most beautiful car in the compact class by the readers of "auto, motor und sport" magazine. The car is already a hit with young buyers as it arrives for sale now. It has a low starting price of 31,178 euros. Mercedes is also introducing the CLA 250 Sport (42,304.50 euros) and the CLA Sport 4MATIC (44,506 euros). The 1461 cc diesel equipped CLA 180 CDI generates 80 kW (109 hp) and 260 Nm of torque. 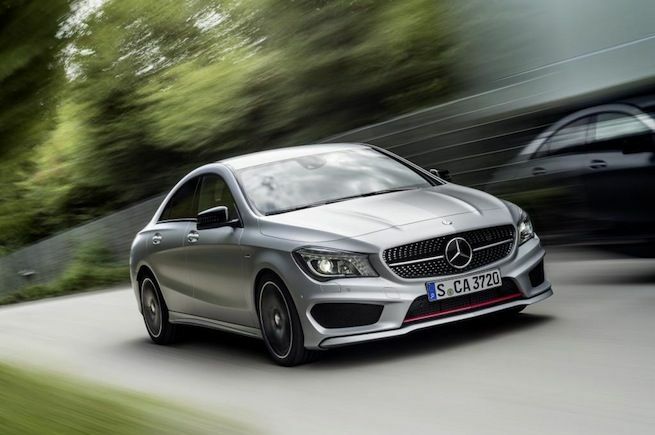 It comes standard with a six-speed manual gearbox and the CLA 180 CDI accelerates from zero to 100 km/h in 11.6 seconds and has a top speed of 205 km/h. The new diesel model should be lively and sets new standards when it comes to fuel consumption. 180 CDI uses only 3.9 liters of fuel (combined) flow through its direst injection per 100 km, corresponding to 102 g of CO2 per kilometer. The new entry-level 180 CDI will be a popular choice with many millennial buyers looking for a low price and high mileage. New buyers will also be able to order the 180 CDI with the Mercedes COMAND Online multimedia system. It’s been updated with real-time traffic information, and the navigation system is considerably better informed about the situation on the roads. Traffic data is transmitted by a "Live Traffic Information" service, which evaluates anonymized data recording the movements of TomTom navigation system users and mobile phone users. This ensures that precise information about traffic holdups on both the planned and possible alternative routes is sent to the vehicle in real time. The new entry-level four door coupe can also be ordered with loads of the latest technology to stay connected. The Drive Kit Plus for the iPhone 5 is available, and when used with the free Digital Drive Style app, this allows seamless integration of the iPhone into the vehicle. Mercedes says it includes Siri voice control and Glympse real-time location sharing. Glympse enables the user to share his or her current location with selected persons. Additional functions include Facebook, Twitter, internet radio, and AUPEO! personal radio. Another highlight includes the advanced navigation system from Garmin with internet-based real-time traffic information, an online POI search function including Street View and a 3D map display. Mercedes has hit the mark with the new CLA-Class, and the new entry-level 2014 Mercedes-Benz CLA 180 CDI is a great fuel-efficient car with a low starting price for young buyers. Mercedes continues to lead the field in diesel technology and the new 180 CDI is a great powerplant. Stay tuned to Torque News for the latest CLA news around the globe.